Donkey Kong the classic arcade game by Nintendo. 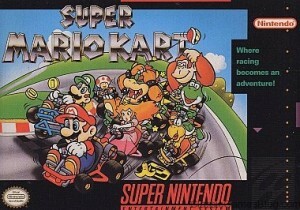 Super Mario Kart was released by Nintendo in 1992. It was the first of a long series of quality racing games. Super Mario Kart’s use of the Super Nintendo’s Mode 7 technology looked revolutionary. The gameplay was and still is fast paced, challenging and a lot of fun! Mario, Luigi, Princess, Bowser, Donkey Kong, Yoshi, Toad and Koopa Troopa. Each character has their own strengths and weaknesses which balances out the playing field. No character was “better” than another which kept things even and fair. There are 3 different racing classes to choose from 50cc, 100cc or 150cc. The higher the cc the faster the karts and the better your opponents are. You have only the 50cc class open by default but by winning races you can unlock first the 100cc and then the 150cc. Just you against the clock. You try to beat your best lap times. You can record and play a ghost to see how you did on your best lap. You race with a friend in split screen action. Compete against the computer with your friend. You play against your friend on one of 4 tracks. The goal is to hit your opponent 3 times to win. It’s a lot of fun and one of the modes you have to try! This game aged well and is still fun to play today. No retro gamer’s Super Nintendo collection should be considered completed without this excellent title. The kart racing formula has been copied over the years but it can never be duplicated. Super Mario Kart is inexpensive and well within the reach of any retro gamer.